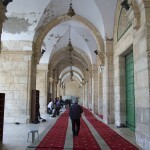 Al-Qibli Mosque (the roofed mosque) is one of the fewest mosques established by the Caliph Omar Bin Al Khattab, one of the most important characters in the Islamic history. 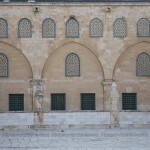 The credit goes to Omar for putting the bedrock of this roofed mosque. The traveller Arcolv, who visited Jerusalem before 680 AD, described a modest wooden mosque which accommodates around 3000 people. 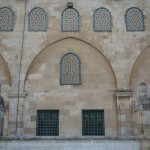 Moreover, the founder of the Umayyad Caliphate (660 – 750), Muawiya Bin Abu Sufian, might have added that modest building. 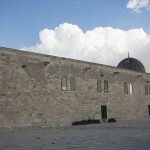 This roofed mosque is located in the middle of the southern wall (Al-Qibli) of Al Aqsa Mosque. 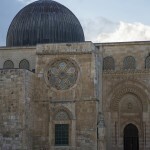 Despite who established it for the very first time, it was surely established within the comprehensive plan of Al-Aqsa mosque done by Abdul Malik Bin Marwan. 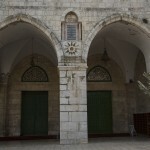 In 714 AD, Al Walid Bin Abdul Malik, who ruled from 705 to 715, reformed Al Aqsa Mosque. 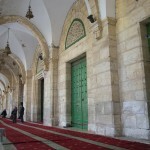 The current roofed mosque is half the original size. 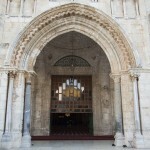 Before, it contained 15 arcades of which only 7 remained. 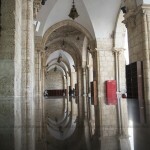 In addition, it lost most of its dimensions due to the successive earthquakes, especially during the Fatimid period, and because of the changes made by the crusaders (1099 – 1178) when they used it as a headquarters for the church and ruling. 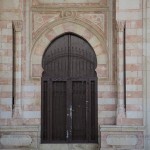 Salah Al-Din Al-Ayyoubi ordered to bring the wooden minbar (platform) which was especially made in 1168 AD during the era of the Sultan Nur Al-Din Zinki (1146 – 1174 AD). 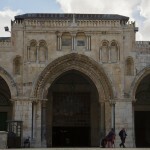 He brought the minbar from Halab and put it in Al-Aqsa Mosque. 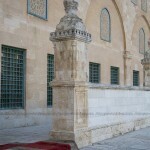 The minbar remained until 2181996 when the fanatic Australian Michael Rohan set Al-Aqsa mosque on fire. 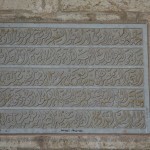 This fire ruined the minbar; all that was left were a few pieces. They are now saved in the Islamic Mosque and they are reason behind its beauty. A new minbar for Al-Qibli Mosque was made in Jordan. 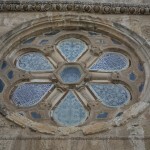 Its shape, size and decoration was made identical to the old one. 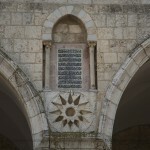 It was installed in its place in 2007. 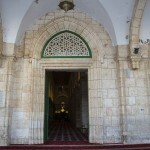 Moreover, Al-Qibli Mosque underwent multiple explosion attempts and it was bombed with rockets in 1980 and 1984. 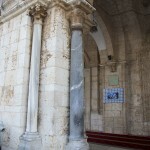 In addition, the excavation work carried out by the occupation authority, in the vicinity of Al-Aqsa Mosque and under it, is threatening the foundations of Al-Qibli Mosque in particular, as it’s built over a ground that is built on the original floor of Al-Aqsa Mosque; it is not directly built on the original floor of Al-Aqsa Mosque. 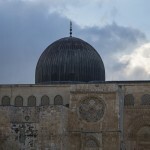 In addition, the embargo on the Islamic restoration work in Al-Aqsa Mosque threatens to weaken the structure of Al-Qibli Mosque and other archaeological and historical buildings inside Al-Aqsa Mosque due to erosion and water leak factors. 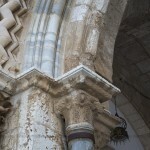 A number of pillars and pieces of marble in Al-Qibli Mosque have started to wear out. 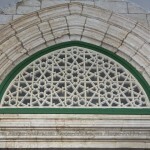 Moreover, a number of decorations and inscriptions on its dome were deformed due to corroding over the years, in addition to the effects of bullets of the Zionists, since 1967, which affected all the domes especially the Dome of Al-Qibli Mosque and the Dome of the Rock. 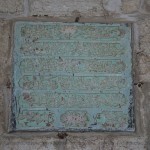 The southern wall of Al-Aqsa Mosque, near Al-Qibli Mosque, was also affected because of the digging by Zionists in the southern area of Al-Aqsa. 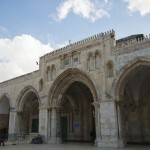 The Occupation Authority did not only stop the Islamic Waqf from renovating Al-Aqsa Mosque, it also established a military barrack in order to supervise its work of distortion. 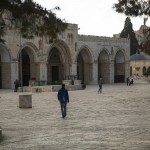 They did this under the name of “development work” and they imposed their control on that part, in addition to other parts surrounding Al-Aqsa. 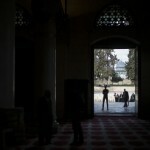 The current Al-Aqsa Mosque has a rectangular shape of 80*55 meters. 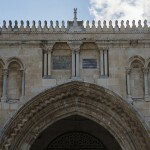 It has 7 long arcades from north to south and 7 other arcades from east to west. 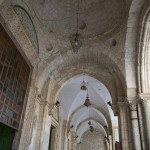 The widest arcade is the middle one, which has a gabled roof that ends with a building. 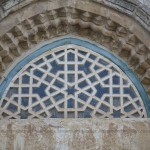 Its shape most probably goes back to the Umayyad period. 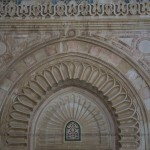 In the center of the middle arcade lies a square-shaped dome which opens the space for a wide arcade in the niche (Mihrab) area. The dome leans on four big arches, each arch has four hollow semi-circular curves decorated with glass mosaics which consists of floral, geometric and written elements. 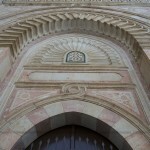 The niche lies in the center of Al-Qibla wall (southern), its shape goes back to period of Salah Al-Din Al- Ayyoubi, and on its right side lies the new niche. 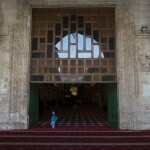 Before entering the mosque from the northern area, a wide open arcade appears in front of the 7 gates of the mosque. 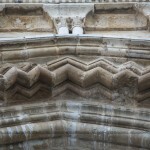 It consists of 7 tapered arches held on stone pillars. 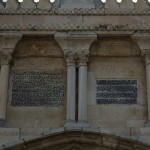 On top of that arcade there are gears and on its front side there are many inscription dating to the multiple architectural work done in this arcade. 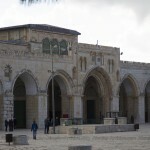 The reconstruction of Al-Aqsa Mosque continued throughout the ages. 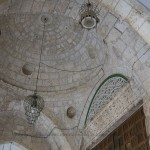 We can hardly find a historical period during which the Caliph or Sultan had not not any kind of restoration or reconstruction for the roofed mosque. 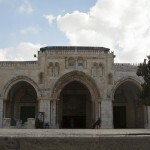 It can be said that Al-Qibli Mosque represents a historical document that tells all the history of the Islamic messages that came to Jerusalem. 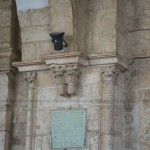 After burnng the Mosque in 1969, and due to the great destruction that inflicted it, a rehabilitation committee was established to supervise its restoration. 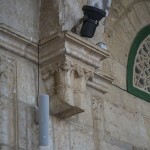 This committee made a great deal of effort in order to return the mosque to the way it was before. 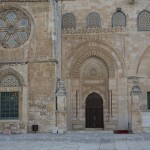 The rehabilitation work of the mosque is ongoing.